By investing in the Muller Martini solution, the media company in the Lusatia region has revolutionized the insert process for its daily newspaper (run size of 80,000) and its two weekly advertisement papers (with run sizes of 226,000 and 250,000 respectively). The three titles, which are currently being produced in a total of 172 million copies per year, contain three times as many inserted products as in 2013. The FlexLiner is ideally suited to such print runs and insert volumes, and is seamlessly integrated into the whole production chain thanks to the Connex.Mailroom control system. 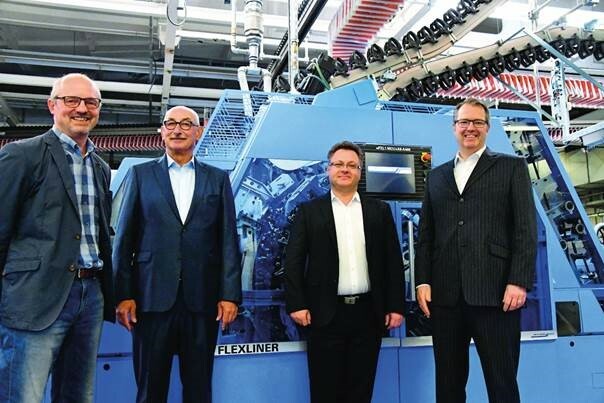 From right to left: Clemens Braun (Managing Director), Andreas Bonow (Commercial Manager), Reinhold Achtner (Sales Manager at Muller Martini Germany) and Frank Käppler (Works Manager) in front of the new FlexLiner at LR Medienverlag und Druckerei GmbH.